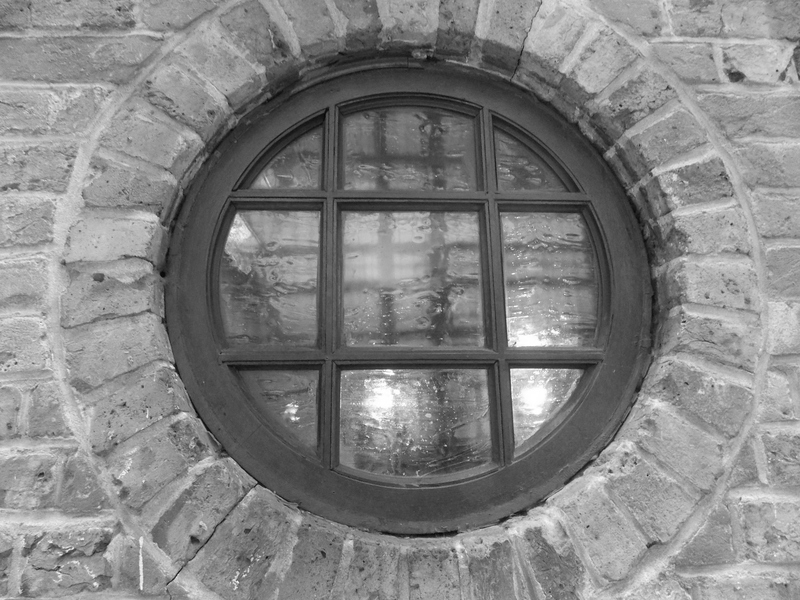 Over the last couple of years I have attempted to convey how the Isle of Dogs to many residents and visitors is a special place which is full of history and mysteries. To illustrate its effect on people, a couple of weeks ago I was contacted by Andrew Harris of Brisbane who visited the Island and endured a very cold, winter holiday in 2011 but the memory of the location stayed with him on his return to Australia. 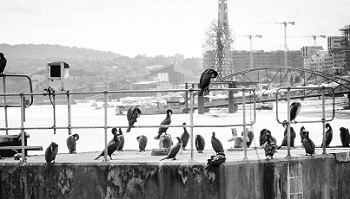 It was this memory that inspired him to compose the following poem. Andrew and his wife were both born in England but emigrated to Australia in the 1960s and 1970s. Andrew was bought up in Beccles, Suffolk but his wife Emma has local connections with East and South London. 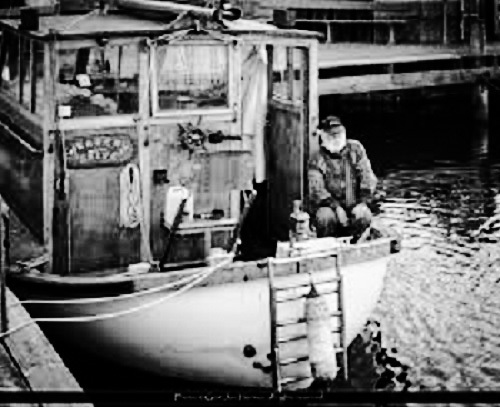 Her father was a boat and barge builder on the Thames in the late 1950s, and despite spending most of his life in Australia retains his London accent and his affinity for the river and its history. 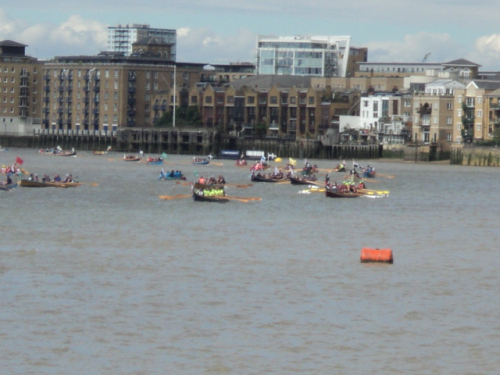 From early morning there was a steady arrival of people and boats for the start of the Great River Race. 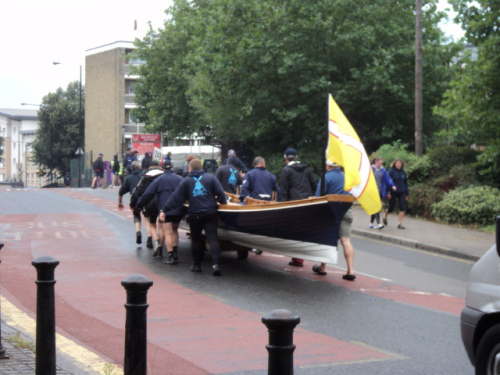 The people get used to delays on the roads on the Isle of Dogs but being held up by small boats is a bit of novelty. 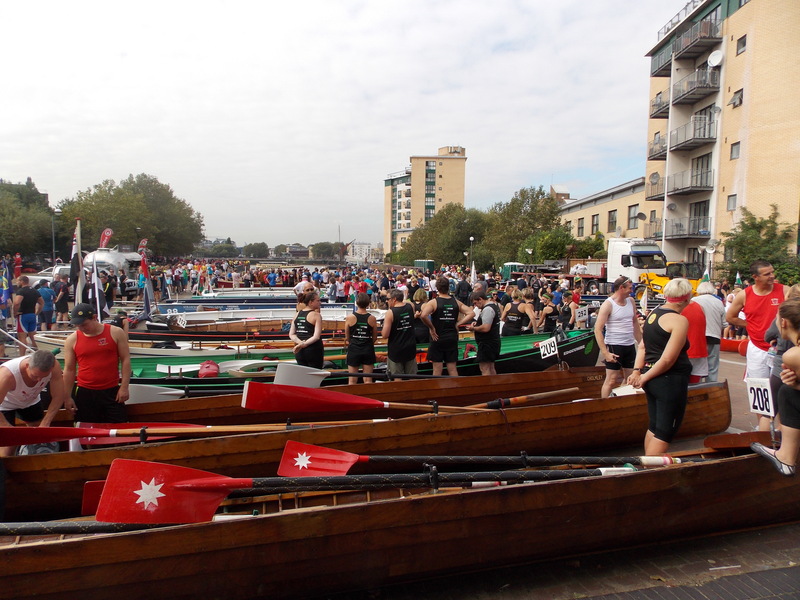 Getting near to the start time , the excitement builds and the logistic nightmare of getting boats and crews into the water begins. 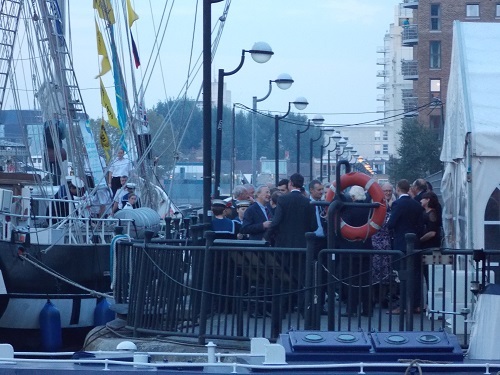 The Millwall slipway and the Docklands sailing centre are quite small but everyone takes the organisation in good spirits and use the time to catch up with old friends and make new ones. 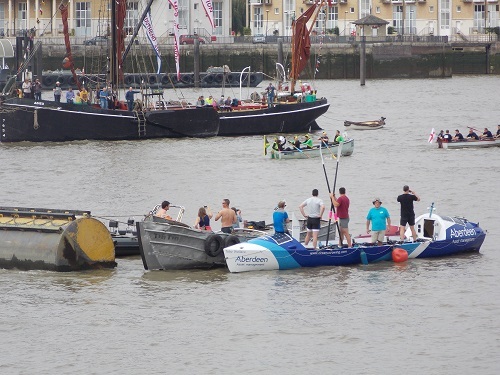 The cannon marks the start of the race when the slowest boats start off first, and the others wait for their turn to begin. 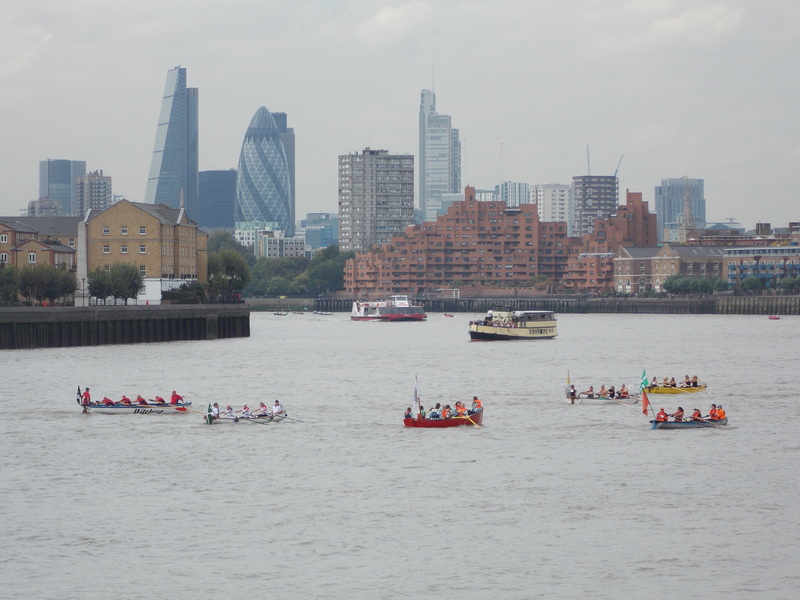 The first part of the race takes the crews up to Canary Wharf and round Limehouse to see the skyscrapers in the City. 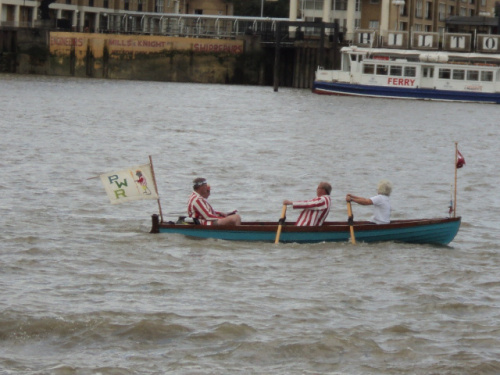 But there are still 20 miles to go in the River Marathon and the finish in Richmond. 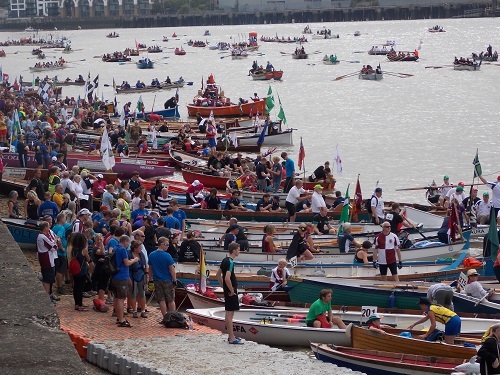 Whilst it might not have the media coverage of the London Marathon, The UK Traditional Boat Championship or the Great River Race as it is known has become a favourite with crews and the public. 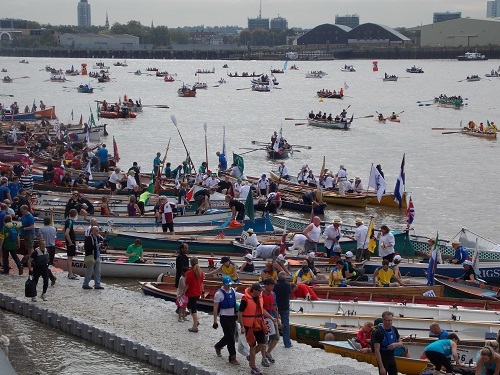 It is known as the ‘River Marathon’ because the course is 21.6 Miles from the Isle of Dogs to Ham in Surrey. 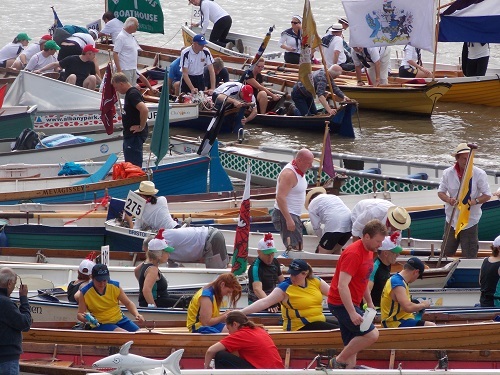 To the uninitiated, the event is a spectacular boat race up the River Thames that often attracts over 300 crews from all over the globe and appeals to every level of competitor from the fun rowers to the more serious racers. There are 35 trophies at stake for the various classes of boats and competitors. 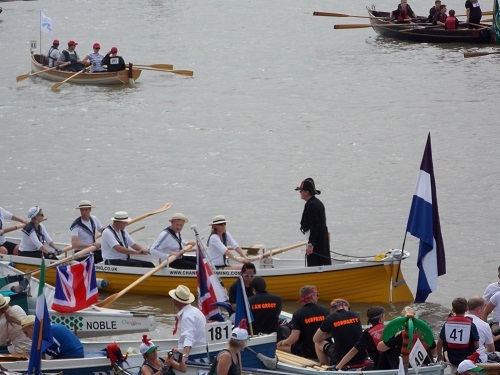 Like the running marathon many of the crews dress up in fancy dress and compete for charities. The Race began in 1988 , but has grown each year and is a real global event attracting crews from all over the world. 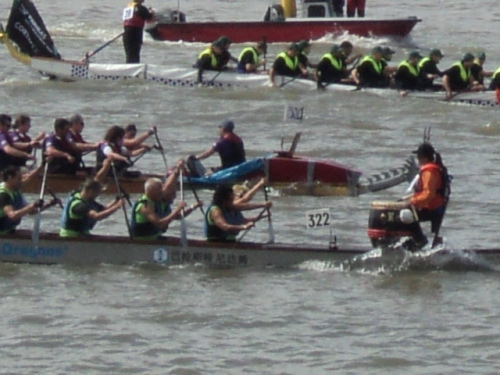 To give all crews an equal chance, entrants were handicapped according to the calculated potential performance of their boats. This was done using a sophisticated computer programme. 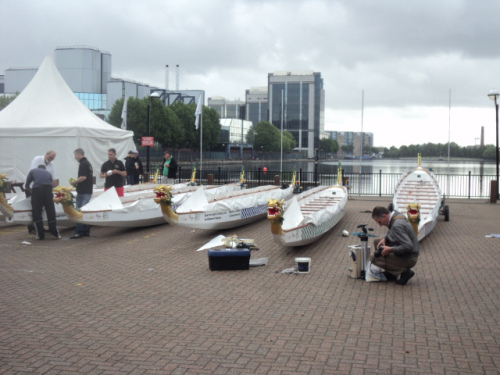 As well as the crews , the entertainment is provided by the amazing array of boats on display from the ever popular Dragon Boats to Waterman Cutters. 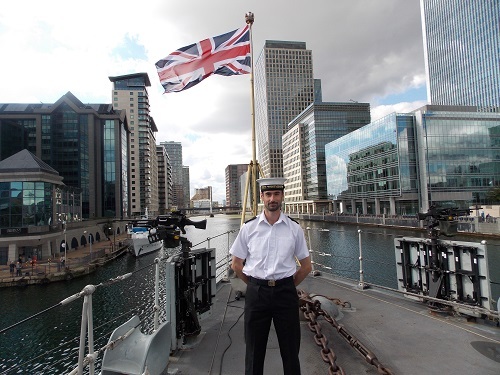 When the HMS Westminster came into West India Dock, I was offered a chance to go on board and meet the Captain and some of the crew . This seemed an opportunity too good to miss, so at the appropriate time I went on board and was escorted to the bridge. Talking to some of the crew, it quickly became clear that the modern Royal Navy is expected to undertake a large number of tasks in an ever changing world from humanitarian rescues to seeing action in the many trouble spots. 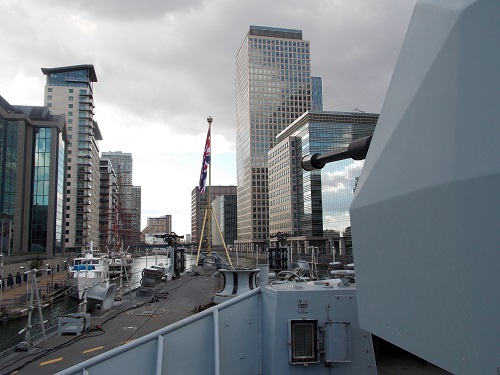 Although the HMS Westminster is 20 years old, the technology on the bridge is being regularly updated to maintain maximum effectiveness. 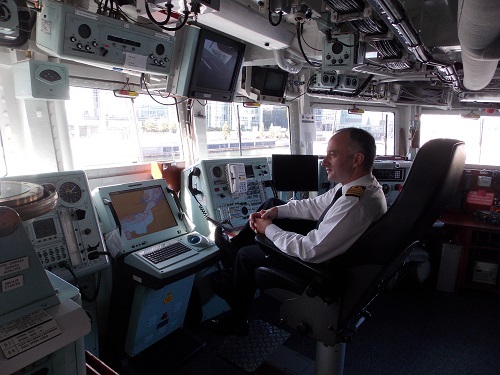 However the bridge is dominated by the captain’s chair from where he directs operations, the Captain after explaining some of the ships capabilities rested in his chair to be surprised by the appearance of a Tall Ship sailing past. 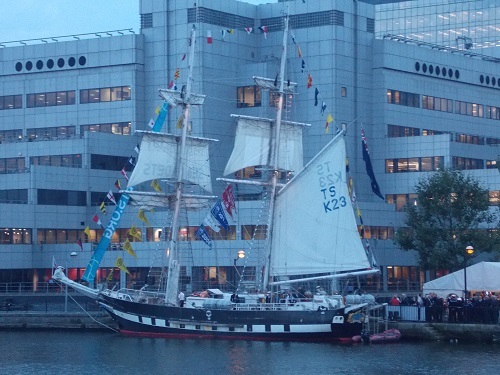 It turned out be the Stavros S Niarchos and waves were exchanged between the two crews. I was keen to find out how many Londoners were on board and was surprised to find out there was only three, it appears that although that ships are linked with a particular place, recruitment can bring crew from all over the UK. However chatting with the Londoners, it was obvious that the links with the City were the source of a great deal of pride. 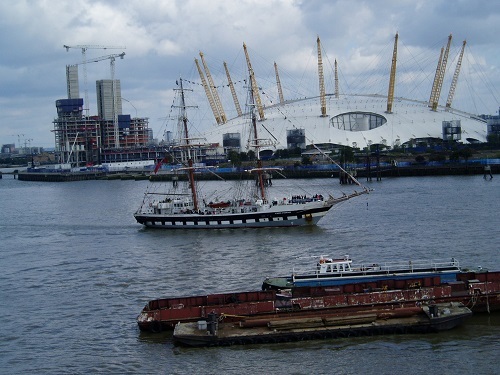 Although I have been on many ships that have visited West India Docks, the visit is usually restricted to the deck and occasionally the bridge. Therefore when I was offered a full tour of the ship I was curious to see ‘behind the scenes’ of the modern warship. 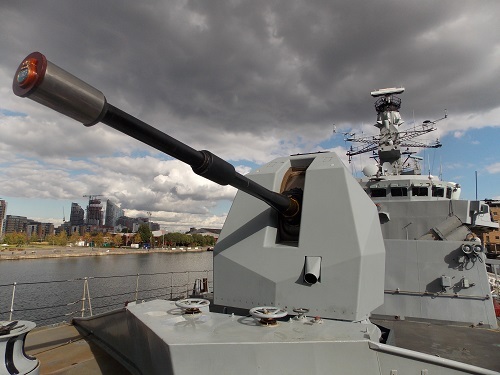 With a complement of 180 to 200 crew and the array of modern equipment and weapons even a quite large warship like the HMS Westminster feels quite cramped under the decks. One of the first lessons a new sailor or a landlubber visitor learns is climbing down the steps between decks requires you to keep your wits about you, if not bumps and bruises will follow or ‘hatch rash’ as its known to the crew. 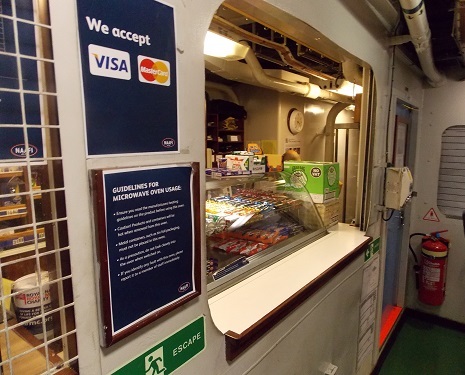 What quickly becomes clear is that the ship has to be a self contained ‘mini- city’ because if you are at sea for weeks at a time, you obviously have to take everything with you. Other than direct action with the enemy , the great dangers on board are fire or water getting into the ship. The large array of systems regulating all aspects of the ship are manned 24/7 and any incident is acted upon immediately. There is also constant training at sea both in battle readiness but also endless safety routines to be carried out. 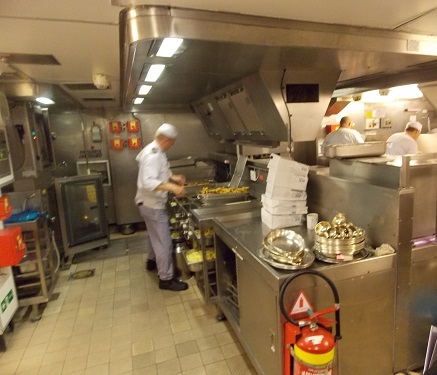 But the life of the modern sailor is not all work , the galley provides a wide range of meals by a team of chefs. And there is even a small shop if you fancy a bar of chocolate . 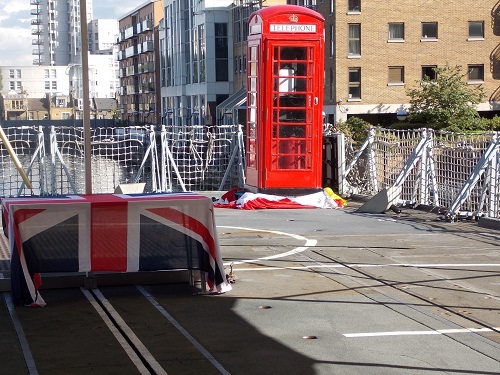 The ship usually carries an helicopter unless in port, but I was not sure why there is a red telephone box on the deck ? As someone who gets seasick on the Woolwich Ferry, I don’t think I would have been attracted to a life on the ocean but it was fascinating to see some of the workings of a modern warship. If you are interested and would like to visit the ship and see some of the sights for yourself, there is an open day on Saturday, tickets are free but must be obtained from Eventbrite here. 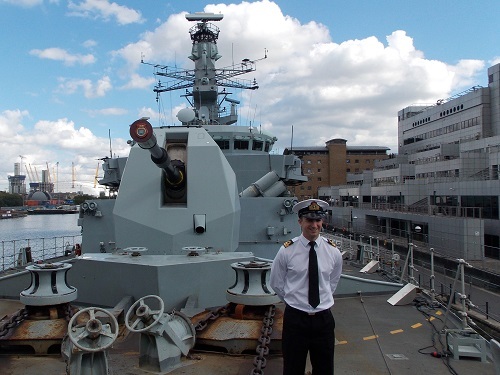 Many thanks to the Captain and the crew of the HMS Westminster for the information and the guided tour. 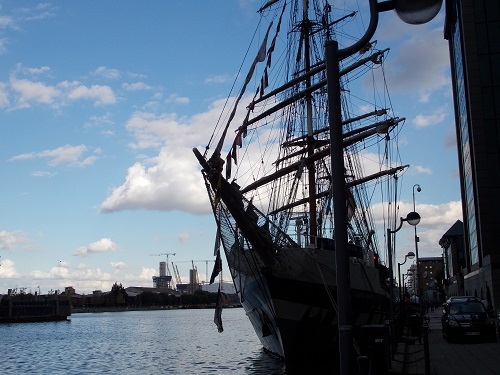 A surprise visitor to the West India Dock today is the Tall Ship Stavros S Niarchos . She was last in the dock at around September last year. 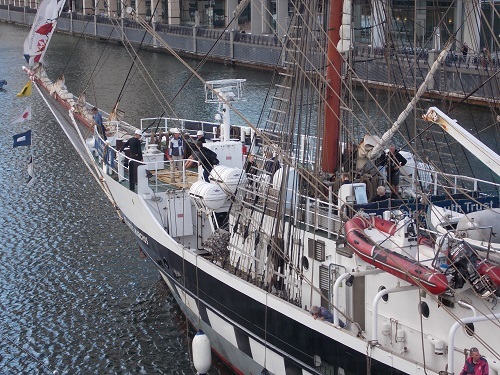 A few weeks ago I was writing about how many of the Tall Ships carry out valuable work training young people and the Stavros S Niarchos is a good example of this. 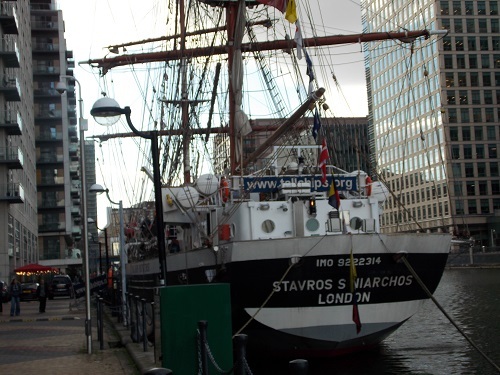 The Stavros S Niarchos is a British brig-rigged tall ship owned and operated by the Tall Ships Youth Trust. 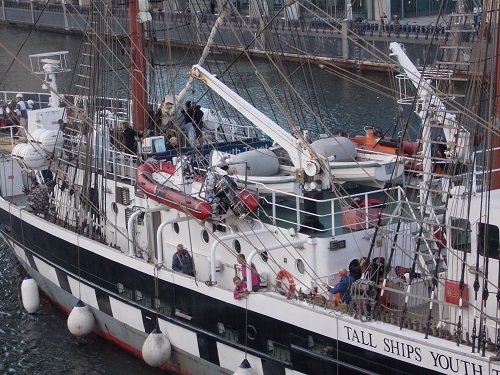 Built in 2000, she has been used to give young people the opportunity to develop skills and talents whilst undertaking voyages to various locations. She is also available for voyages and holidays which provides revenue to maintain the operation of the ship. Since its inception in the 50s the organisation has taken 100,000 trainees to sea and sailed 1.9 million nautical miles. The ship has a Length of 197ft , Masts of 148ft and Beam of 32ft, she usually operates a crew of 69 which include regular crew and volunteers. The large tall ships can be expensive to maintain, earlier in the week I reported that the TS Royalist was due to be decommissioned for that reason. 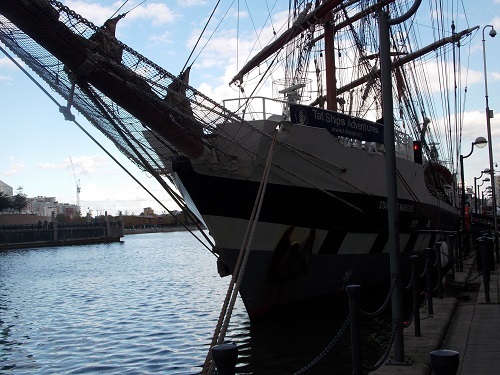 The Stavros S Niarchos is relatively new but was put up for sale last year, it does not appear that she has been sold yet, however the market for second-hand tall ships must be quite limited. She joins the Super Yacht Christopher and the HMS Westminster in West India Dock at the moment to offer an interesting selection of ships. 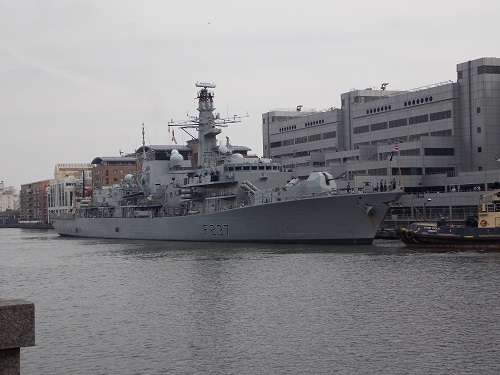 After all the recent activity with Tall Ships , West India Dock welcomes a very different type of ship with the arrival of the HMS Westminster . 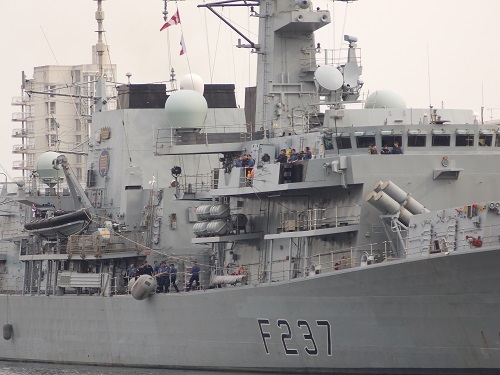 The Type 23 frigate will be moored in London for six days and undertake a number of engagements . 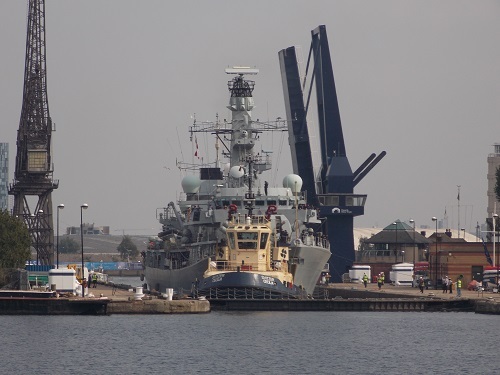 Built in the famous Swan Hunter yard in Tyne and Wear and launched in 1992, the 133-metre ship, last visited London in March 2013, since then the ship has had a seven month deployment to the Arabian Gulf, then returned to the UK in February 2014 when she underwent a maintenance period . 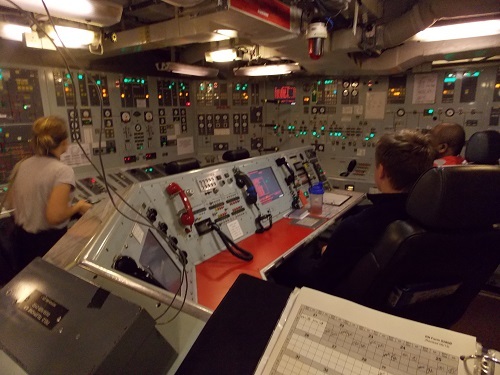 As the Royal Navy’s primary Anti-Submarine Warfare (ASW) Frigate, Westminster has undergone tactical development trials with HMS Illustrious ; this was followed by ASW operation activation due to Russian submarine activity. 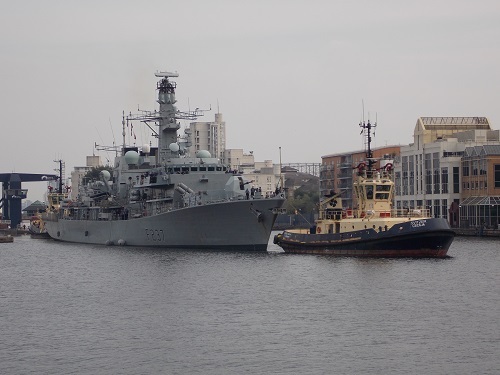 More recently, HMS Westminster has undertaken a training exercise with the Royal Navy Reserves. 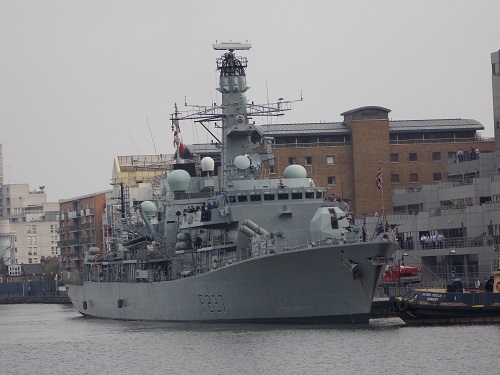 One of its high profile engagements whilst in dock will be a parade through Westminster, the Lord Mayor of Westminster will allow the ship to exercise its right to the Freedom of the City, with drums beating, colours flying and bayonets fixed as they parade through the streets. The parade will be led by the Band of Her Majesty’s Royal Marines and the procession will form up at Horse Guards Parade at 8.45am. 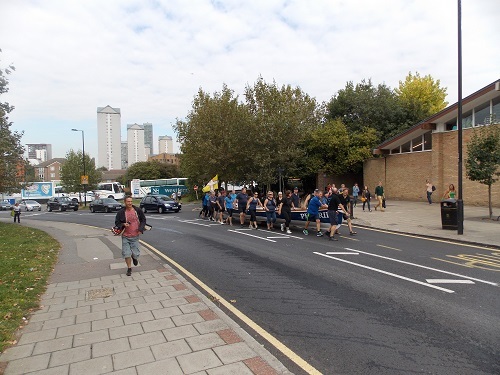 The parade will then march onto Horse Guards Road and onto the Mall through the centre of Admiralty Arch and around Parliament Square before arriving at Westminster Abbey for the march past at 9.40am. 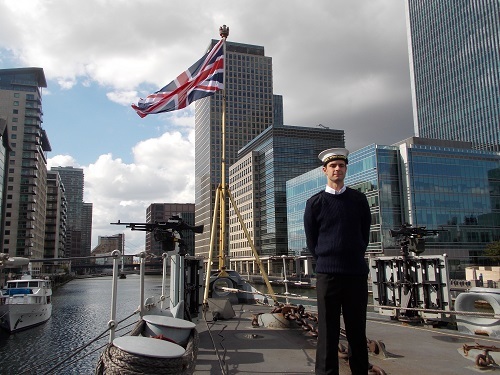 On Saturday September 27 , HMS Westminster will be open to members of the public so that local people have an opportunity to experience life on board a warship. 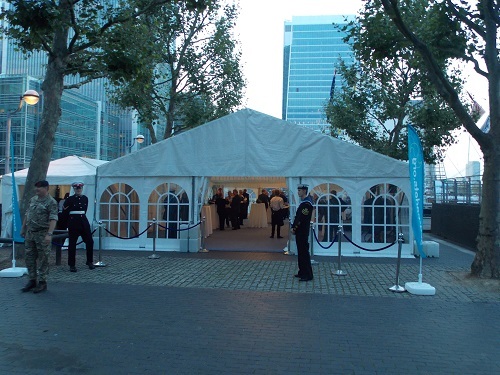 Open from 9am until 5pm – with last entry to the ship at 4pm – tickets are available on the hour between these times. Tickets are free but must be obtained in advance from www.hmswestminstertickets.eventbrite.co.uk. 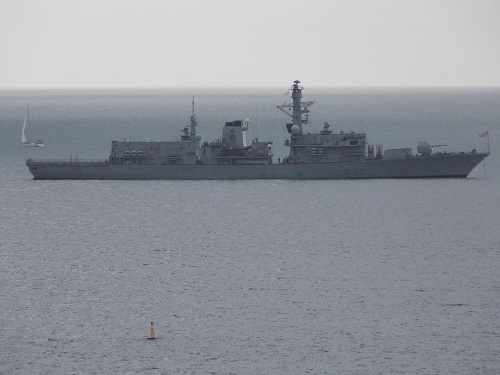 One recent events that the HMS Westminster attended this summer was the Bournemouth Air Show, by a coincidence I was staying in Bournemouth for a few days and caught the first day of the show. 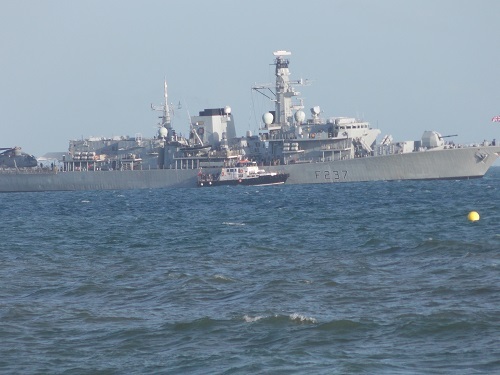 here are a couple of photographs of the HMS Westminster in Bournemouth. 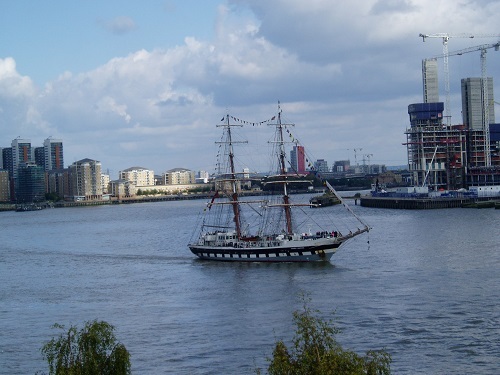 When the Tall ships departed in the Parade of Sail along the Thames, one Tall ship was left behind in West India Dock. 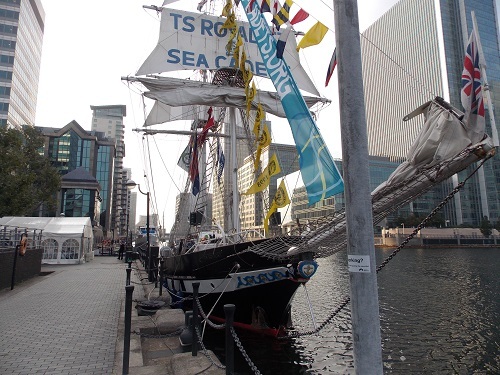 The ship is the TS Royalist and last night a celebration took place to honour its service for the Sea Cadet organisation. Although it was a celebration , there was a tinge of sadness as the old ship is due to be decommissioned after over 40 years service. TS Royalist was built by Groves and Guttridge, Cowes, Isle of Wight. 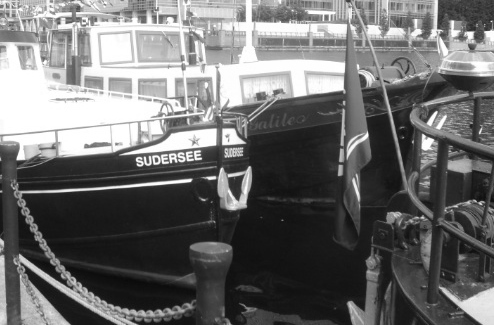 and launched in 1971 by Princess Anne, in her years of service it is estimated she has taken over 30,000 cadets to sea. 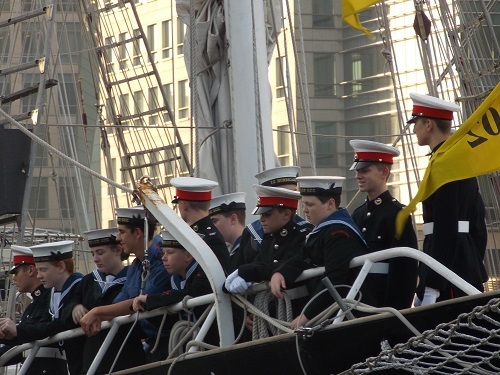 The cadets generally join the ship for a week and learn the rudiments of sailing a large ship. 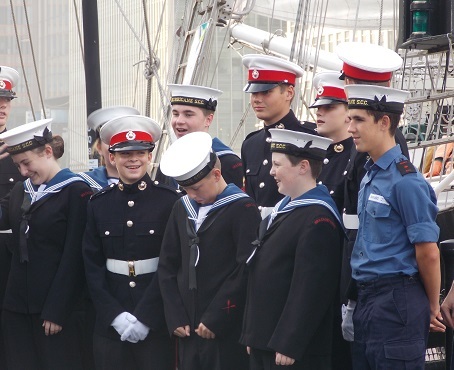 The Sea Cadets organisation is a national nautical youth charity offering young people between 10 and 18 a taste of the nautical life and is based on the customs and traditions of the Royal Navy. The organisation also help the young people to develop a range of life skills and boost confidence and self esteem. The TS Royalist is built of steel, with an overall length of 29 metres (97 feet), and is designed as a traditional square-rigged brig . However in recent years she has became increasingly expensive to maintain, therefore the decision was made to commission the building of a new ship with advanced sailing ability and performance. Raising nearly 4 million pounds in two years , the organisation awarded the contract to a Spanish shipbuilder but is sourcing a considerable amount of the equipment from the UK. 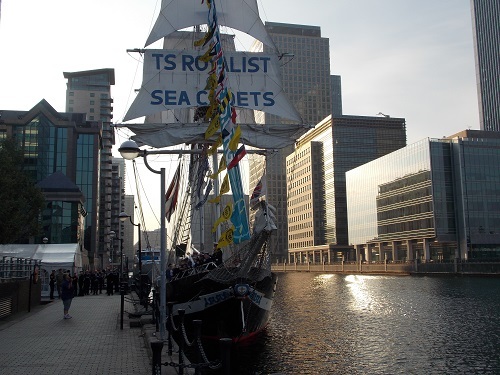 The TS Royalist is a familiar participant in the Tall Ship festivals and races and regularly visits many UK ports and ports in France and other part of Europe.